Home » Uncategorized » Give Attendees Product Information in the Format They Want! Today, there are movements advocating the elimination of paper entirely from the business-to-business exhibition floor and those advocating the virtues of all things digital. Though when it comes to attendee preferences, what do they want? Well, research suggests that one size does NOT fit all. Providing paper only, post-email follow-up only, USB’s etc. isn’t necessarily going to make every visitor happy. The figure above from CEIR’s Exhibitor Product Information Sharing Practices suggests offering attendees a mix of options to collect product information is wise. These results indicate that a substantial percentage of attendees in general still want paper. That result doesn’t mean that large reams of paper need to be made available as an information giveaway in a booth. Though it does suggest the wisdom of offering some kind of paper collateral piece to give to attendees who would like this option, a piece that will remind them of their visit to a booth, perhaps a postcard or other lower cost item with the key features and benefits of products showcased at the event, pointing them to a URL to access more information or the contact person to reach out to for more information. There are creative ways to satisfy the need for a takeaway item while minimizing collateral expenses and avoiding the exhibition floor trashcan. Even in the Digital Playbook, it was uncovered that traditional tactics were being reduced, not eliminated from exhibition marketing efforts. One of the most mentioned traditional tactics being reduced is paper collateral. Though again, it’s a reduction, not an elimination. One respondent in this study noted that the flashier, more expensive paper collateral was reserved for meetings aimed to impress a prospective client. So higher-cost collateral pieces can remain behind a counter for the highly-qualified prospects who want that information piece. 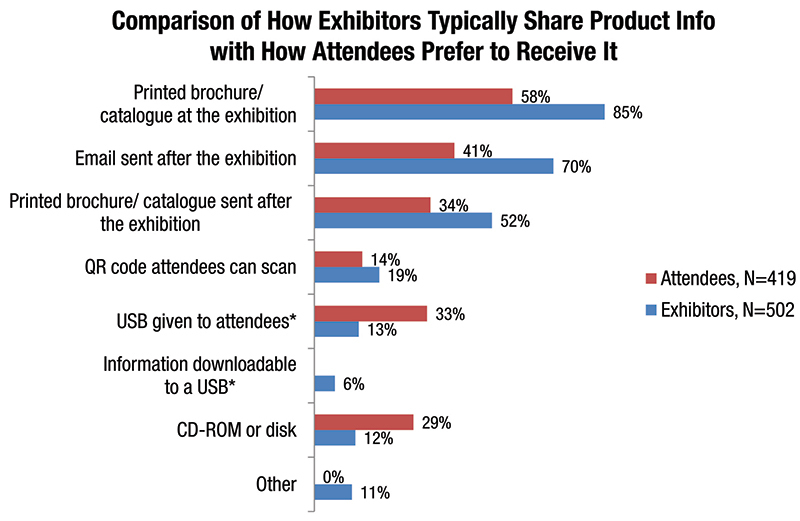 Other options do satisfy substantial minorities of attendees, with post-event emails or mailing a printed brochure to them after the exhibition. Another issue to consider is how effective is each information-sharing option in supporting an organization’s overall objectives for exhibiting? Some methods perform better than others. To find out which options are most effective, take a moment to download the report available at: Exhibitor Product Information Sharing Practices.